Potatoes have been food for mankind for thousands of years, traveling the globe from civilization to civilization, country to country. Ancient drawings tell of their cultivation and harvest by the Incas around 2000 B.C. in the high elevations of the Andean Mountains of South America. Amazingly, thanks to the cold climate of their high altitude, the Incas preserved their spuds by the earliest known form of freeze-drying. When the Spanish Conquistadors didn’t find the gold and silver they were looking for in the late 1400s and early 1500s, they quickly cornered the local potato market. Potatoes were soon a standard supply item on their ships. The Spanish noticed that the sailors who ate papas (potatoes) did not suffer from scurvy. Scurvy is a disease associated with too little vitamin C in the diet. Potatoes have a lot of vitamin C, easily preventing scurvy. The potato was slow to become popular in Europe because it was thought to have ties to the nightshade plants, a group of plants that are generally very toxic and used for black magic and poisoning. However, by the late 1500’s the potato began to be used as a common provision in some parts of Spain, although it was initially first considered peasant food. Potatoes eventually became popular with the upper and noble classes of Europe after a French pharmacist named Antoine Parmentier, championed them to French King Louis XVI by creating a wide array of potato preparations. Parmentier had been a German prisoner of war in the mid-1700s during the Seven Years War between France and Germany. While in prison he was forced to subsist on potatoes and spent time trying different preparation styles. The potato quickly took the place of other crops as a food staple because it was a more reliable crop than wheat, which suffered as a food crop when the damp climates of Europe prevented proper ripening. Potatoes furthered both an agrarian revolution already underway in the early 17th century, and a population increase in Europe in the 17th and 18th centuries. As a result, more and more farmers were drawn from subsistence farming into profit-driven economies. The agrarian revolution, stimulated by the potato, was integral to the Industrial Revolution. Ironically, the dependable potato was responsible for one of the most horrifying famines of the last 200 years. 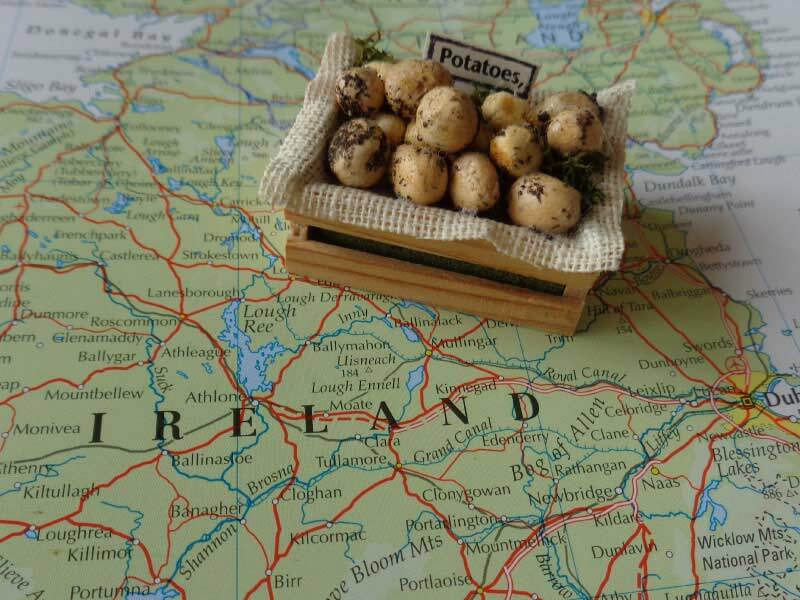 Introduced into Ireland in the mid-1700s, the potato proved to be an ideal crop for its environment. Ireland gets an average of 60 inches of precipitation each year, in general too much for potatoes. However, the precipitation is mostly in the form of soft misty showers, which keep the air cool and the soil moist. By the 1800s, Irish peasants were eating a daily average of 10 potatoes per person. Potatoes supplied about 80 percent of the calories in their diet. The peasants used potato fodder to feed their animals, animals that provided milk, meat and eggs to supplement the peasants’ diet. This dependence on one food crop was dangerous, but no other crop had ever proved to be as reliable. In the 1840s, disaster struck. Three successive years of late blight, the microscopic fungus Phytophthora infestans, and heavy rains rotted the potato crops in the ground. Without potatoes, both the peasants and animals went hungry. And when the animals died for lack of food, milk, meat and eggs were no longer available. It is estimated that more than one million of Ireland’s 8 million inhabitants died of starvation; almost 2 million emigrated. The population of Ireland was reduced by almost one-fourth and has never regained its former numbers to this day. 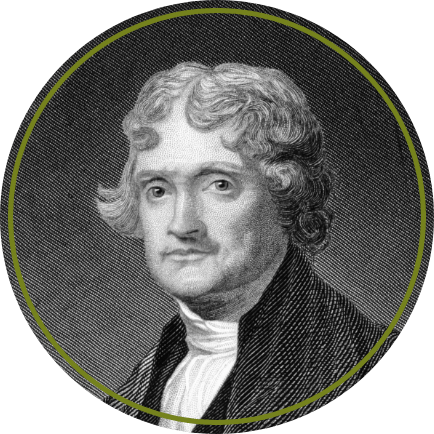 Thomas JeffersonEuropean immigrants introduced potatoes to North America several times throughout the 1600s, but they were not widely grown for almost a century. Not until 1719, when Irish immigrants brought the potato to Londonderry, New Hampshire, were potatoes grown on a large scale. Again, potatoes were slow to gain popularity. However, as the popularity of potatoes began to grow in America, Thomas Jefferson gets credit for introducing “french fries” to America when he served them at a White House dinner during his presidency in 1802. While serving as minister to France, Thomas Jefferson sampled them in Paris and brought the recipe home. Seeking to improve the “Irish potato”, a self-taught American horticulturist, Luther Burbank, took the first step with a new variety that he found grew three times more tubers of a better size than any other potato variety. After testing his new variety, Burbank marketed the seedling he called the Burbank to the West Coast in the late 1800’s. A more disease-resistant mutation of the Burbank was discovered a few years later in Colorado and was named the Russet Burbank. Today, several varieties of the Russet are some of the most popular potatoes! Potatoes are now the most important vegetable in the world and, not surprisingly, America’s favorite vegetable. We eat 126 pounds per person per year, as baked, roasted, mashed, fried and more! Today potatoes are grown all through the United States—if only in home gardens in some places–and in about 125 countries throughout the world.